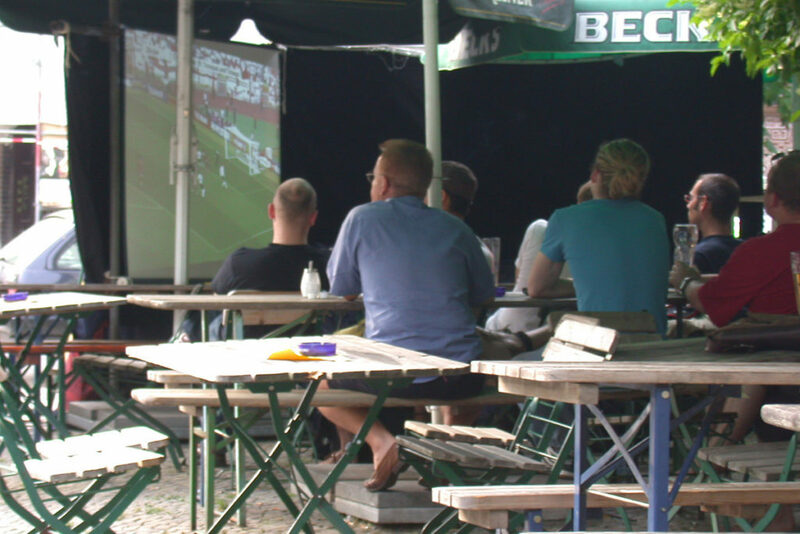 Since the Football Worldcup 2006 there is a new “German” word: Public Viewing. Since the football world cup was hosted by Germany and Berlin in 2006, at least every two years screens and displays of all sizes seem to pop up at almost every Berlin street corner. Or at least in some parts of the city. And then people are gathering in front of these screens, having a drink, watching the game – Public Viewing. At least for Prenzlauer Berg I can say that whenever there is a World Cup or Euro Cup or Champions League match aired, you can basically walk down some streets without loosing contact to ‘the game’. Of course there is also regular sports bars in Berlin, showing football matches on a regular basis – but that is something completely different. Many restaurants, bars and even quite many fast food stands, hot dog booths and kiosks put a screen on display and turn up the volume. Sometimes it’s just a regular TV set with a couple of chairs in front of it – sometimes there are video projectors put up and the restaurant terrace turns into a mini movie theater. The most prominent, most ‘public’ viewing occasion probably is Berlin’s official fan fest called Berlin Fanmeile – or “FIFA Fan Fest Berlin” to use the official name from 2006. With a capacity of around 100.000 guests this party between Brandenburg Gate (Brandenburger Tor) and the Victory Column (Siegessäule) is also Germany’s biggest public viewing event. But here not every game is shown – only the matches the German team participates AND all matches of the Knockout stage until the Final. Access is free – no admission fee – but the area is fenced in and you have to entrer through one of the official entry gates. Expect a security check – so If you are actually planning to go here, please remember not to take any fire crackers, animals, chairs, alcoholic beverages, bottles, weapons or anything that can be considered ‘dangerous’ to the event. Fan Fest schedule: The 2018 edition of the Berlin Fan Fest Fanmeile will be open on 17. and 23. and 27. of June – and all matches from the last 16 on – of course including the final on Sunday 15. July 2018. The Public Viewing arena at Kulturbrauerei is one of the larger events. The court yard can host up to 15 thousand football fans. From 10th June through 10th July basically every match is shown on 24sqm large screen. There will be beer booths and sausage stands nearby – and in case the weather turns bad there are enough venues that may provide shelter. Doors are open and screens are on two hours before each match – for some matches the admission fee is 3 Euro, other matches are free. Further information in German on the website of Kulturbrauerei. The beer garden Golgatha inside Kreuzberg’s Victoria Park is quite a classic when it comes to watching football matches. The location was originally built when the nearby football stadium Katzbachstadion was built. During the Euro Cup 2016 all matches are shown on various screens across the beer garden and on large screens inside the venue. Further information on the venue’s website. Also the Spandau Citadel can host a couple of thousands of football fans of all ages. Just as at Fast Fest in Tiergarten, from 12th of June through 10th of July every match the German team participates in AND all matches of the Knockout stage are shown. Admission is free – and the venue is known to be quite child friendly. Further information in German on Citadel’s event website at www.fussballfamilienfest.de. Please check in advance if the venue is actually showing the match you want to see! A big and beautiful public viewing location for all matches is “Treppenhaus 9” . It is at the “Ringbahn” S41/S42 at the station S+U Neukölln – so everyone can easy find it. Very big HD screen, cool prices of drinks, nice fun sports for before/after the EM matches (tabletennis, lasertag, and so on), cool music, funny staff.